How a surprise made Joey’s stay at a hotel remarkable. What Mandarin Oriental did to win more Michelin stars than any other hotel group in the world. Businesses that win big by taking care of the “bystanders” who come along with their customers. This week, we take a look at “How Mandarin Oriental Won 18 Michelin Stars” by Sarah Jappy for Christie’s Luxury Defined. Winning one Michelin star is a huge deal for any restaurant, but how do you win more stars than any other hotel group in the world? Obsessive attention to detail and the ability to turn mistakes into magical moments. Get your product right first, and then you can enhance the experience with great service. Build in service that anticipates the customer’s needs and then goes above and beyond with certain flourishes. Don’t automatically reject a mistake, there might be an opportunity to turn it into something magical. When Joey went to Banff with his family for a conference, they stayed in a beautiful historic hotel called the Fairmont Banff Springs. Their ability to observe their customers, personalize the experience, and surprise them made it one of his favorite stays of the last year by far. As promised, here’s a picture of Joey’s kids sporting their amazing (and surprising) treasures. When you observe your customers, it gives you fantastic data points that let you customize the experience and make it even more remarkable. 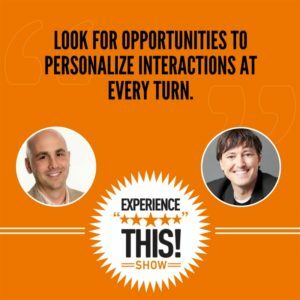 Look for opportunities to personalize the interactions at every turn. When you get the chance you can surprise a customer by thinking ahead. While Joey was in Banff, they happened to visit Mountain Galleries at the Fairmont close to closing time. When the owner sees Joey’s kids and finds out they’re going to be staying in town for a few days, she produces two customized sketch pads for them to draw in while they’re there. She couldn’t have had any idea at the time, but Joey and his wife ended up purchasing some paintings on their last day at Banff, and some free publicity from Joey’s speech at his conference nearby. We look at this and other examples of how you can pay attention to the “innocent bystanders” who are with the paying customer. It’s not just about the customer, it’s about the people who are with the customer. Make the people around the customer feel special too, and you’ll create tons of word of mouth, happier customers, and more new business in the future. 88% of people feel better about a brand when the advertising is personalized to them. As Joey said in an early episode, one of the most pleasing sounds to anybody’s ear is their own name, so it’s no surprise that more personalization leads to a more favorable impression. Personalization is the best way to create marketing that connects favorably with customers. Joey: Get ready for another episode of the Experience This! Show. Join us as we discuss the secret recipe to earning Michelin Stars, the difference between temperatures in Fahrenheit versus Celsius, and what to do about the innocent bystanders that are hanging out with your customers. Stars, freezing, and bystanders. Oh my! There are so many great customer experience articles to read, but who has the time. We summarize them and offer clear takeaways you can implement starting tomorrow. Enjoy this segment of See Express where we read the articles so you don't need to. This week's See Express comes from the Christie's website Luxury Defined and is written by Sarah Jappy, a London-based writer who regularly writes for Mr. and Mrs. Smith and the LUXE City Guides. The article is titled "How Mandarin Oriental Won 18 Michelin Stars." Dan: 18. Now that is a lot of stars. Joey: That's a lot of stars. Dan: For our listeners who may not know, the Michelin Stars were actually created as part of the Michelin Guides, which are a series of books that are published of course by a tire company called Michelin for more than a century. That all makes sense because back in the day people looked to their tire company as they were traveling via land and wanted to know where the best places were to stop. Michelin started publishing these books and have been doing so for more than a hundred years. These stars are awarded to the best of the best and they're very, very hard to achieve. They represent excellence in the hotel and restaurant industry. Joey: Absolutely. What's interesting is when Michelin announced stars for 2017, the Mandarin Oriental received more stars than any other hotel group in the world. This article dissects their recipe for success. You see what I did there, Dan? Recipe for success? Joey: I worked on that for a while. Okay. Here's what the article says are the important things to do if you want to win Michelin Stars. By the way, this will all come back to some great relevance for customer experience. Just bear with us. First, you want to leave some wiggle room for the magic to happen. The article tells a story of Heston Blumenthal. Heston is a top British chef who runs a restaurant called ironically enough Dinner by Heston Blumenthal that is located at the Mandarin Oriental Hyde Park. Chef Blumenthal is known for developing dishes at his secret kitchen offsite and then bringing them into the restaurant. One of his most famous dishes is the Meat Fruit. Dan: I'm sorry. Did you say meat or fruit? Joey: I actually said both. The Meat Fruit is an interesting dish. It gets its inspiration from the medieval [French 00:02:58]. Apologies to all of our French speaking listeners if I pronounced that inappropriately, but basically it's fake apples. These are made by taking minced veal and pork, coating it in green parsley custard and then serving these alongside real apples. What's interesting is as part of the new take on this medieval dish that chef brought to the table, the chef is supposed to dip the frozen parfait into a Mandarin gel and leave it to cool. Well, one of the chef's on Blumenthal's team made a mistake and dipped it twice. Now what's interesting is this was a deviation from the rules, but a happy accident was produced. The happy accident was that the apple, this foe apple that they're creating, now had dimples in it that made it seem more like a real piece of fruit. While they have this really rigid system for how they were going to create a unique experience with the Meat Fruit dish, the chef and his team were open to enhancing the experience because of a happy deviation in the plan. Dan: You cannot beat an apple with dimples. I've always said that. Joey: You can't beat Meat Fruit. I mean come on. Dan: Definitely sounds tasty. You know, I think the takeaway here is you got to get your product right first. I mean in order to receive a Michelin Star, first and foremost, you need to have fantastic food. The Mandarin Oriental restaurant clearly use only the finest ingredients and that is really from their most exquisite dining dishes all the way down to their hamburgers. Then you can enhance the food experience with great service. This part I think requires flexibility and intuition on part of the staff. I mean they need to be able to shape that experience to what the particular patron in the restaurant wants during the meal. Michael Groll, who's the director of food and beverage at the Mandarin Hotel in Hong Kong, said and I quote, "You value your return customers by recognizing their preferences, by building up that relationship that goes beyond the regular service and food offering: that personal relationship, where people feel connected." Joey: The personal connection where people feel connected. I love it. We've talked about this a lot on the show. That's what takes an experience to the next level. I think if you were to ask anyone who's ever been to a Mandarin Oriental restaurant or stayed or checked in and chatted with any of their employees, you'll find that I think everyone agrees that the reason these restaurants have earned more Michelin Stars than anyone else is because of their commitment to the customer experience. There's a quote in the article by Nicolas Dubort, who's the director of food and beverage at Mandarin Oriental New York. Nicolas is quoted as saying, "Each guest has different expectations, but our goal is to delight and wow them. We want to exceed their expectations and create lasting memories." I love this quote because a lot of people that work in the customer service and customer experience field talk about surprise and delight and wowing their customers. I like the added twist of not only exceeding the expectations and really impressing and surprising your customers, but helping to create lasting memories. The Mandarin Oriental really does this by designing multidimensional meals. They take incredible ingredients, unexpected pairings, breathtaking ambience and wind all of this together into an absolutely fantastic overall experience. I think there are three key takeaways to this article. First, you need to get the product right. Use the best components or the best ingredients. Make sure that your quality is out of this world because if the product that a customer is buying for you isn't top-notch, we don't even have the chance to get to the experience portion. First and foremost, you got to put all the effort in to make sure you get the product right. Secondly, you want to build in service that anticipates the customer's needs and then goes above and beyond with unexpected flourishes. We've all been in that dining situation where the wait staff just kind of hovered and interrupted too much. We were trying to maybe on a date have a quieter conversation and suddenly it's like the waiter became part of the date as well, but then there are other times where it's like no, we wan to make sure that you're around and attentive. The service needs to be really flexible and anticipate what the customer wants. Third and finally, you need to be open to constant improvements and enhancements. Don't automatically reject a mistake. There maybe an opportunity to turn it into something magical like a Michelin Star. Sometimes a remarkable experience deserves deeper investigation. We dive into the nitty gritty of customer interactions and dissect how and why they have it. Join us while we're dissecting the experience. Hey Dan, have you ever been to Banff, which is located up in Canada? Dan: Well, I have visited many fine cities in Canada, but unfortunately I have never made it to Banff. Why? Joey: Oh man, you got to get up to Banff. First of all, beautiful city, amazing people. I was there for the first time recently in about a decade. I've been there years and years ago, but I was back there recently and had the pleasure of staying at the Fairmont Banff Springs. This hotel is incredible. It's located right in the heart of Banff National Park, which is by itself stunning. It's a UNESCO World Heritage Site, which means it's going to look incredible on your postcards and in your Instagram. The hotel rises up out of the mountains in this way that just is gorgeously picturesque. In fact, the hotel is often referred to as Canada's Castle in the Rockies. It's this 125 year old plus hotel that just has all the old charm of like old world hotels. I had some incredible experiences there with their staff that made this one of my favorite stays of the last year by far. Dan: Well, I'm excited to hear about it. I mean sometimes staying at a 125 year old hotel can be lots of fun and a step back into time, and sometimes you stay at a 125 year old hotel and wish that you're staying at perhaps a newer hotel. Joey: Yeah. No, this was definitely one of those glorious steps back in time. The Fairmont Banff Springs gets so many things right that we could do an entire ... We could actually do several shows on talking about what an awesome hotel it is, but there were a couple of things that I wanted to talk about that fall into three categories: observe, personalize, and surprise. First of all, observe. Picture this scene. It's about a little bit after 11 P.M. at night. I come walking into the hotel with my wife and my two boys who are aged four and two. We've been flying all day. They're pretty beat. Not only did we fly into Calgary, but then we drove like an hour, hour and a half, to Banff. By the time we get there, the whole family is pretty tapped. My amazing gracious wife stays with the boys back kind of off the beaten path in the lobby and I go up to check in and I meet a young man named Sam who's checking us in. Almost immediately in the conversation he says, "Oh, Mr. Coleman, are those your sons back there?" I was like, "Oh dear god. What? Yes, I'm sorry. I know they're being a little loud. It's late. We're tired." He goes, "Oh no. No problem at all. I was wondering would it be possible for me to give them a gift of a stuffed animal?" I mean I was shocked. I was like, "Yeah, that'd be awesome." He proceeds to produce from behind the desk a stuffed animal beaver and a stuffed animal polar bear, right? It's Canada of course. 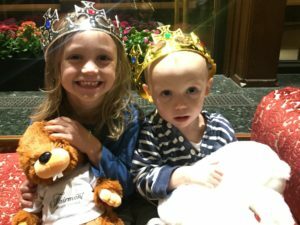 Both of these stuffed animals are wearing Fairmont Hotel Banff Springs t-shirts and then he also produces some crowns, like king crowns, for the boys to wear. Basically because this hotel is known as the Castle in the Rockies, he gives me the two crowns and the stuffed animals and says, "Why don't you go give those to your boys while I finish getting your room ready and then you can walk back over here and I'll have the keys and we'll be ready to send up to the room?" I was blown away. Not only was Sam paying attention. He spotted my kids in the lobby and then he went that effort or to that extra level, if you will, to give them some gifts. Great way to start the relationship based on his observations. Dan: I would say that both Sam and the Fairmont Banff Springs know a little secret, which is the key to a customer's heart is often through their kids. He identified that you had kids, that you've been traveling all day, that they were probably tired. The bottom line is if your kids really like staying at the Fairmont Banff Springs Hotel, there's a good chance you're going to come back. If they have a great experience, there's a good chance that your experience is going to be great. Joey: 100%. In fact, we'll include a photograph ... I took a photograph of the boys at this moment. We'll include this in the show notes at experiencethisshow.com. When you go on that, you'll be able to see obviously that my older son is thrilled. My younger son looks like he's a walking zombie, but anyway, they were super excited to get these gifts. You're right. It made us very happy about the hotel. The second thing they did, which was awesome, was they personalized the experience for us. Here's how that happened. We've got all of our luggage. We're there for a few days and so they asked, "We're going to have Paul, the bellman, bring the bags up to the room." This nice man Paul meets us up in the room and he puts our bags into the hotel room. Then he says, "Mr. and Mrs. Coleman, would you like me to orient you to the room?" What's interesting is it's a hotel room, right? I say this respectfully. I've been in a lot of hotel rooms, but whenever somebody ask and they ask kind of in a nice and formalized way, I always take them up on the offer and my wife is kind to indulge me because I want to see what are they going to do to create the experience. Paul says, "Let me show you first and foremost the thermostat." He said, "Given that you're from America, I presume you'd rather have it in Fahrenheit instead of Celsius." He flips the button that changes the readout from Celsius to Fahrenheit. It was just this tiny little thing that took him a millisecond to do, but in that moment I thought, "Wow. Here's someone that's paying attention and knows that Americans, forgive us, are kind of us fools when it comes to doing temperature in Celsius. We're so used to Fahrenheit that he's just going to help meet me where I'm at and switch it to Fahrenheit right away," which was a very gracious offer on his part and a tiny little thing that definitely caught my attention. Dan: I love that. I mean that is definitely knowing your customer. It is a little thing, but we've talked about on the show many times that the little things really matter. Imagine the experience of you A, reading a thermostat and not understanding the number, and B, maybe having trouble finding that switch of changing it from Celsius to Fahrenheit, which potentially could lead to C, which is that you've got to call the front desk and bother someone downstairs and frankly create a hassle for them to explain it to you. This guy wiped all of that out and very quickly made the experience better for you. Joey: Absolutely. Given that it was late at night, I would have figured out that the temperature was array at about 3 o'clock in the morning when we either woke up freezing cold or steaming hot in the room. He took care of the problem while we were awake, which was greatly appreciated. The third cool thing they did at the Fairmont Banff Springs was around the area of surprise. We had been out all day at Lake Louise exploring and we came back and I found a note laying on the ground between the room and the bathroom in the hotel from Kelly in housekeeping. Next to the note were a couple pairs of slippers. The note said, "Mr. and Mrs. Coleman, I apologize. A glass accidentally got broken while I was cleaning the bathroom. I believe I've picked up all the shards of glass, but in the off chance that I haven't, please go ahead and enjoy these slippers. We don't want you to get cut while you're working around the room." What's so crazy about this is I was like, "Oh, isn't that sweet? What a nice considerate gesture. How thoughtful." The next day, because we were there for a couple of days, the next day I actually found a little shard of glass kind of way, way far away from the bathroom, but still within, for lack of a better way of putting it, breakage distance. It was clear that it did come from this glass. While normally I would have been like, "Oh my gosh, we just found glass. We need to look all over. We've got little kids in the room," instead I was like, "No, it's all good. Kelly warned me about this. We're okay." I just love that they thought ahead and took something that was "a mistake," a broken glass, and really turned it into a moment of surprise and delight. Dan: I mean think about the opposite of that, right? The opposite of that is covering up a mistake. If she covers up the mistake and then you find the glass, your experience is very different. If it happens that you stepped on the glass or your kids get hurt by the glass, now you've really gone in the wrong direction in terms of the experience. I love that she got ahead of that as well. Maybe it was over cautious, but I think better safe than sorry especially when there's kids in the room, which she probably could tell by the looks of your room and the items in it. I thought it's a fantastic example. Joey: No, I agree. Here's what we can learn about creating remarkable experiences from the incredible team at the Fairmont Banff Springs. Number one, you need to observe your customers. When you observe your customers, it gives you fantastic data points that allow you to customize the experience and make it even more remarkable for them. Number two, you should look for opportunities to personalize the interactions at every turn even if it's the simple of things, switching a thermostat from Celsius to Fahrenheit. These little things are the things that matter and frankly become the things that your customers talk about maybe even on their podcast when they're sharing what a remarkable experience they had with you. Finally, number three, when you get the chance, you can surprise a customer by thinking ahead. When you help think ahead like Kelly did of, "Oh, what if they find glass later? I'm going to give some slippers. I'm going to give a note so they're not worried," it really gives you the opportunity to standout from the crowd and create an interaction with your customers that will leave them feeling really connected to you and that you're looking out for them. Kudos to you Fairmont Banff Springs. You created a remarkable experience and it was a real treat to stay on your glorious property. We love telling stories and sharing key insights you can implement or avoid based on our experiences. Can you believe that this just happened? We both have kids and I'm guessing you may have had an experience like one I had recently, Dan, or at least an experience that started out the same way. I'm at an event up in Canada, in Banff actually, I talked about the Banff Springs Hotel in the previous segment. We go to dinner and around 9:30 P.M. find ourselves back at the hotel. In the kind of on the ground floor of the hotel we're staying at is a place called Mountain Galleries at the Fairmont. It's an art gallery that is run by a woman named Wendy Wacko. We're walking through the gallery and it's clear that they're kind of closing down or we're walking past the gallery rather. We love going to art galleries and so I said to my wife, "Let's just duck in here and see what we can see." We duck in with the family. I don't know that the woman whose in there is the owner because she's clearly done some type of an art thing that night where they've been painting so she's kind of dressed more like a painter than the owner of the gallery. We start talking a little bit. She's almost immediately more interested in my two kids than me. This is nothing new for me, but she takes it to a different level. She finds out that we're going to be there for a few days and she says, "Oh, well, you boys are going to want to draw some pictures while you're here," and produces two sketchbooks, if you will, sketchpads that are branded with the Mountain Galleries branding and imagery and says, "Here you go boys. Here are some free sketchpads for you to draw in while you're here." It was this tiny little thing, but it really got my attention because you don't necessarily think of an art gallery as being excited about catering to the children that are there. In fact, most adults wouldn't bring their children into an art gallery. I and my wife skew from the school of thought that if you want your children to appreciate art, you need to expose them to art at a young age. Nonetheless, it was a really touching little gesture by Wendy. Long story short, we find out that Wendy is in town to attend the event at the hotel that I'm speaking at, which is a tourism event for Travel Alberta. What's fascinating is and the reason I want to share this story is because A, Wendy was amazing and she was so great, but B, to give that specific example of how creating a great experience leads to good things for your business. I try to practice what I preach. I did a couple things. Number one, we ended up buying two paintings from the gallery while we were there. Now Wendy had no idea that we were going to purchase paintings when we first came in and in fact, we purchased them on our last day. She got direct revenue from making that investment of treating our boys well. She also got publicity because I gave a speech to 700 people in the travel and tourism industry who were not a hundred yards away from her gallery when I gave the speech where I sang her praises and talked about what an awesome gallery it was, and told this story and encouraged people to go. She got some, for lack of a better way of putting it, free publicity to a really target rich audience that was right there by her gallery and now she gets to be on the podcast. Wendy, thanks for creating remarkable experiences for me and for my family at Mountain Galleries in Banff. Dan: You know, I know a lot of people are probably thinking, "Okay, but how many times does a speaker and podcaster walk into my business?" I don't think that's really the point. I think the point is is that the very best marketing that you can ever do is word of mouth marketing. You've probably seen the same studies that we have seen. The most believable person to talk about your business is a customer or a friend who tells you that they had a good experience. Joey in this case is way more believable than Wendy going out and saying, "Hey, I've got the best art gallery around," but Joey saying it gives her a whole lot more credibility. It doesn't have to be a person that speaks in front of 700 people. It can be anybody that just tells their friends or shares on social media and brings more attention to your business. Joey: Absolutely. I think the interesting thing is ... You're right. She had no way of knowing that I was a speaker. She had no way of knowing that I have a podcast. She did this before she knew any of those things and I think it's because it's her personality. She really looks out for her patrons and the people that come into her store. That's just kind of her energy and her ethic and her spirit. The point you make, Dan, as usual is spot on. If someone is in your place of business or interacting with your business, I guarantee that they know other people that would be great prospects and great customers for you. I love going to art galleries. Not everyone that I'm friends with collects art, but many of the people I'm friends with like to collect art. When I give a shout out to a gallery that was great to work with, I have enough friends that are also potential customers of Wendy's that I guarantee are going to say, "Oh, this is a gallery we want to learn more about or we want to go see next time we're in Banff." It's not just about the purchase side of it though. Some of this can be about making you feel good about a purchase you already made. As we've talked about on the show many times, I travel a ton. My airline of choice is Delta. Lots of times when I'm traveling my wife and my boys are along with me. One of the things that my four year old has gotten very accustomed to do and always wants to do is when we're getting on the plane, he wants to cruise by the cockpit and say hi to the captain. What's fascinating is watching the different ways that pilots and copilots handle this pretty much across the board. Delta pilots are incredible about not only saying, "Oh, nice to meet you. What's your name? Do you want to come up here and see what it's like up close," and they let him come up and maybe they'll even let him flip a switch or two on the panel, and they kind of talk about how the plane works and that kind of thing, and invariably give him some extra little wings and the flight attendants give extra snacks. The purchase is already made. We already purchased the plane tickets and these little touches to go above and beyond to, for lack of a better way of putting it, the innocent bystanders, my kids who are just along for the ride, who are not the ones making the purchase decision, but are treated in high regard because they're with the paying customer. I think that's kind of the key takeaway at least of how both Wendy did it with the gallery and how Delta does it in treating my kids. Dan: Absolutely. We said it in the last segment, I mean treating people's kids well are going to make the parents really happy and is going to improve the experience of the parents as well. Joey: Absolutely. I think there is no business that I can think of that doesn't have the opportunity to pay attention to the people who are, for lack of a better way of putting it, along for the ride. The Sheraton Denver Downtown, this hotel in Downtown Denver that I stayed at not too long ago, has a treasure desk at the valet desk so that when you valet park your car, if you have kids, they will invite you over to the treasure chest for your kid to pick out a toy. Like it's a matchbox car or a little doll or some little playing cards or something or a little stuffed animal. These are small inexpensive toys that the folks at valet have decided they want to create this little special touch. What's so cool about this is I was actually talking at dinner last night before we recorded the podcast today about this episode and I mentioned that the treasure chest and my four year old son went bonkers. He was like, "Oh yeah, daddy, remember I got the matchbox car and it was the blue one?" This is something that happened probably six months ago, which in his life represents what, let me do the math here, an eighth of his life ago. He had total recall of what he got and how fun it was. Again it was because they were willing to recognize that when someone pulls up to park their car, invariably there's a high likelihood that there are other people in the car. Creating opportunities for interactions with them allows you to just deepen the experience with all of the customers, not just the driver. Dan: Yeah, totally agree. 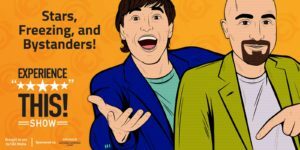 This idea about focusing on the customer and whoever is with the customer oftentimes you don't know who the customer really is or who the decision maker really is, right? You hear stories about a husband and wife going to buy a car and the salesperson only talks to the husband, right? Maybe it's the wife that is the decision maker in that particular case. In the case of kids, I mean if you're at a restaurant, oftentimes as parents we end up at the restaurants that our kids want to go to, not always the ones we want to go to. Even when you assume who the customer is and who the person paying is, you might not be right. Joey: I always take one. Dan: Yeah, of course. The adults take them too. Dan: Obviously. It's great when you talk into a bank with kids and the kids are excited to go to the bank and they remember going to the bank because they got a lollipop. Man, I mean those lollipops are $0.03 each. Definitely easy ways to create an experience for all of the people who matter in the transaction. Joey: Absolutely. I think our key takeaways here is that it's not just about the customer. It's about the people that are with the customer. Make the spouse, make the friend, make the kids, make the other "innocent bystanders" that are with your customer feel like they're special too and that's going to lead to tons of word of mouth, happier customers, better experience overall, more new business in the future, and happier employees because they get even more interactions and opportunities to make someone stay. Don't forget about the people who are along for the ride. Create a great experience for them as well. Listen in while we try to stomp and surprise each other with a fantastic statistic from the worlds of customer experience and customer service. It's time to check out this number. This week's number is 88%. What do you think it means, Dan? Dan: I'm going to go with the percentage chance that I would agree to a karaoke battle with you, but alas it is also the percentage chance that you'd win. Joey: You're too kind. Maybe we should do a future segment of karaoke battle. Actually the 88% refers to the percentage of people who feel better about a brand when the interaction is personalized to them. This statistic comes to us from a survey done in collaboration between OneSpot and Marketing Insider Group. I found this survey on the Smarter CX website that our friends at Oracle have created. Dan: Wow. Thank you, Oracle, for sponsoring the Experience This! Show. Dan: That statistic makes a ton of sense to me. I mean I remember one of the things you said in one of our very first episodes about how one of the most pleasing sounds to the human ear is your own name. That is the simplest form of personalization. The more brands can personalize I do believe that they will create customers who feel better about them. Joey: Totally. To find more proof for the benefits of focusing on customer experience and the power of personalization, you want to visit smartercx.com/experiencethis. If you could do us a little favor here at the show, use that landing page so that our incredible sponsors at Oracle know that you listen to the show and you're checking it out. What you'll find at the URL is Smarter CX by Oracle. It's a brand new destination for professionals in the customer service and customer experience world who are looking to build the next generation of customer experience. Guys, I know they're a sponsor of the show. I'm going to just riff here briefly. I actually really like this site. Normally when, and I'm going to say this to be honest, normally when somebody's like, "Oh, go to this corporate site and you can see our content," you're like, "Useless. This isn't going to be interesting." The very first time I went to this site, I kid you not, I tagged like a dozen articles to read just because I really thought that they were doing a fantastic job of not only presenting the content, but making it quality content. Go check it out to find breaking CX news, to find in depth analysis, to find useful tools you can choose that will empower you to create remarkable experiences for your customers. Check out smartercx.com.